I grew up in a home where I watched my mother successfully try her hand at the latest and most popular crafts. I never thought of myself as artistic or creative so never attempted to try any of them. Seven years ago I moved from crazy, frenetic Gauteng to the beautiful serene seaside town of Melkbosstrand in Cape Town. Being in a different mind space, while on holiday in 2006, my mother showed me her latest passion which was Pewter Embossing. I was totally amazed with the beautiful items she had created. I immediately called Mimmic Studio where my mom learned the craft and booked a couple of lessons with Pewter guru (my muse and inspiration) - Mary Ann Lingenfelder. I loved it and when I saw that I could actually create something pretty descent my mind started racing with ideas and opportunities. When I returned to Cape Town, friends and family saw my creations and asked me to teach them and this is how the classes were born! 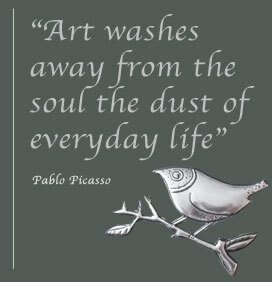 Not only the art, but the teaching aspect of Pewter has totally changed my life. I believe that when a person is in touch with their creative side, they are happier, balanced and fulfilled. I guess what I am saying is that everyone has a creative side that just needs awakening!